(CNN) -- Pirates off the eastern coast of Somalia picked the wrong target this week when they tried to attack a U.S. Navy ship, the Navy said Thursday. Pirates off the coast of Somalia tried to attack the USNS Lewis and Clark on Wednesday. The attempted attack happened Wednesday against the USNS Lewis and Clark, a dry cargo and ammunition ship that supports the U.S. Navy 5th Fleet and coalition ships in the area, the Navy said. Two pirate skiffs pursued the Lewis and Clark for more than an hour as it headed north, the Navy said. They got as close as one nautical mile from the ship. The Lewis and Clark sped up and tried to escape the pirates, and the ship's security team issued verbal warnings to the approaching skiffs, the Navy said. The suspected pirates, who were then two nautical miles behind the Lewis and Clark, fired small arms at the ship. They fell a mile short of the ship's stern, the Navy said. The Lewis and Clark sped up and the skiffs stopped their chase. Evasive maneuvers and other defense measures such as on-board security teams have worked to protect other ships and their cargo, the Navy said. That was the case late Wednesday morning in the Gulf of Aden, when a Greek vessel fended off a pirate attack. The Greeks hit the approaching skiff, causing the pirates' boat to capsize, the European Union's Maritime Security Center said in a written statement. A Spanish crew recovered seven pirates from the water and detained them, the statement said. No casualties or damage was reported. A Dutch cargo crew in the Gulf of Aden wasn't so lucky Thursday, the maritime center said. The small cargo vessel was hijacked, likely by Somali pirates, while sailing west in the transit corridor. The crew of eight Dutch sailors, who had Coca-Cola on board, altered the craft's course toward Somalia, the center said. The crew is believed to be unhurt. More than 30,000 vessels transit the Gulf of Aden each year, the Navy said. So far this year, there have been 97 attempted attacks on merchant vessels, 27 of which have been successful, the Navy said. 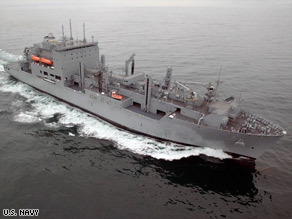 The Lewis And Clark is one of six dry cargo/ammunition ships in the U.S. Navy's Military Sealift Command, which delivers supplies to the U.S. military around the globe. The ship also supported the counter-piracy task force in the area earlier this year, the Navy said.